Cybercriminals recognise this as an opportunity and seek to trick us into installing malicious software (malware). Software publishers and mobile network providers increasingly require code signing from a trusted Certificate Authority (CA) before accepting code for distribution. 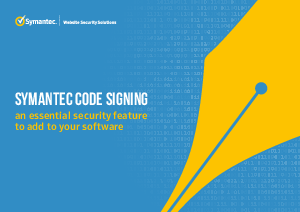 By code signing software, developers can ensure the integrity of their application,protect their intellectual property and brand image and help combat malware.